The Metropolitan Manila Development Authority (MMDA) will soon prohibit buses from southern provinces to enter Metro Manila. Their analysis says that these provincial buses contribute significantly to Metro Manila traffic; thus, the solution is to ban and prohibit them from entering the metropolis. Is this a good analysis? In July 2013, MMDA proposed a two days a week cars-not-allowed in M.Manila, from the current one day a week. Public adverse reaction was high and MMDA was forced to abandon it. Then in August 2013, MMDA prohibited provincial buses from Cavite and western Batangas to enter M.Manila and forced them to stop at Uniwide coastal mall, supposedly to reduce traffic in MM. I and other observers suggested that it will only worsen traffic. Many of those bus-riding probinsyanos ("promdis") are car owners, so they will be forced to bring their cars from Cavite because it is now a hassle to take multiple rides. And MM traffic has worsened. See Fat-Free Econ 45: Newton's Laws of Motion and Traffic Congestion, August 11, 2013. 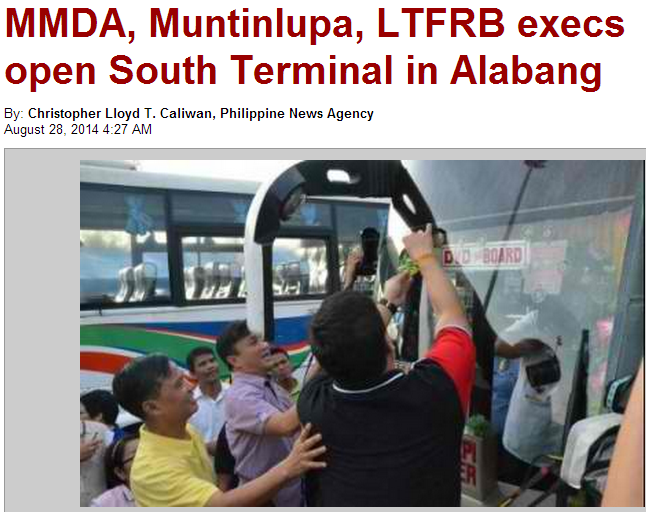 Now MMDA and other government bureaucracies will prohibit buses from S. Luzon to enter MM. Expect more cars from those provinces to enter MM and traffic will worsen. The law of unintended consequences will haunt those bureaucrats, and the rest of us. And I think MMDA will revive again the previous proposal of two days a week private cars prohibited in Metro Manila from 7am to 7pm. The MMDA, some local government units (LGUs) and Land Transport Franchising Regulatory Board (LTFRB) bureaucrats always put the blame on others, never on themselves and their policies. Many of those current bus riders from Batangas and Laguna are car owners, but they opted not to bring their cars because it is more convenient by air-con bus to go to Makati, Ortigas or Quezon City. Especially if they are carrying a luggage, or a laptop and other important materials. It is convenient to get off at Cubao then take a taxi to final destination. Now people will take provincial bus + Manila bus + taxi or jeep, then repeat the process going back home. The inconvenience of multiple transfers. Plus many Metro buses are generally less comfortable compared to provincial buses; they also travel slower as they make many stops. And Metro bus hold-ups are a continuing scourge that the government cannot solve until now. So expect some if not many of these promdis to bring their cars to MM and traffic will become even worse. Bureaucracies always have knee jerk reactions to problems that very often, they themselves created. Their previous regulations and prohibitions are not working, they attracted the law of unintended consequences, so they create new prohibitions. The minds of central planners. Centrally plan things; since things don't work with old plans, make new plans, new prohibitions. Another problem, LTFRB gives franchise to bus units to ply a particular route for about five years I think. Say it gave a franchise in 2013 for buses to travel until Cubao, to last until 2018. Then this year, 2014, LTFRB dishonors the permit it gave by supporting MMDA prohibitions. Government makes rules then change these in the middle. Officials who have little or zero experience running a public transportation yet regulating and prohibiting public transpo. * Reposting this from Business Mirror. CIVIL-SOCIETY group Citizenwatch has proposed several action plans that the Aquino administration should focus on in its last two years in office, particularly in the areas of power generation and promotion of medium-scale enterprises to create more jobs. In a recent roundtable discussion among the conveners of Citizenwatch, the need to lower the costs of power and to provide for a reliable source of power for industries was underscored as one of the most important problems that must be addressed by the government. Prof. Dindo Manhit, who convened the roundtable discussion, enumerated possible action plans that can address the looming power crisis. 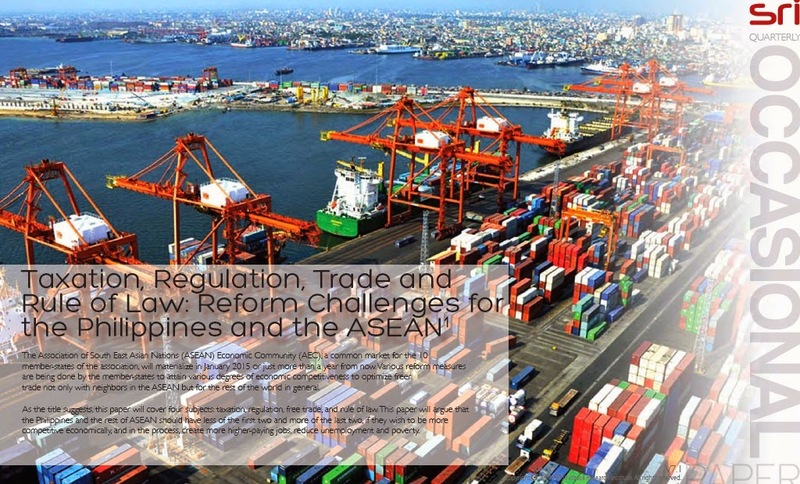 Free trade advocate Nonoy Oplas of Minimal Government Thinkers Inc. said that the government must reduce red tape to be able to make the Philippines competitive, especially in light of the upcoming integration of the ten members of the Asean. He said that reducing red tape would help in addressing many of the country’s problems, including the power crisis. “In energy for instance, I think [Energy] Secretary Jericho Petilla said that feasibility studies show that building a power plant will require about 100 signatures from the barangay to the Department of Energy, etc. In this case, more government is a problem,” Oplas said. The coming financial integration of the 10 Asean members was also discussed, with focus on providing for financing for micro, small, and medium enterprises (MSMEs) as a program that will make Philippine industries competitive with its counterparts in other Asean countries. Sergio Ortiz-Luis, president of the Philippine Exporters Confederation said that the financing of MSMEs is critical to the Philippines because these types of enterprises comprise 99 percent of our entire economy. “One of the disadvantages of our local industries is financing. We are the only ones still talking about it whereas our neighbors have already resolved the issue of financing for MSMEs,” Ortiz-Luis said. Alfredo Yao, president of the Philippine Chamber of Commerce and Industry, also provided his suggestions on how to make the country competitive amid the Asean integration. He said that the government needs to address the concerns on power, infrastructure and red tape to be able to attract more foreign investments when the Asean integration starts in 2015. “In the several forums that we have conducted, the high cost of power and logistics, inadequate transport infrastructure, conflicting laws and regulations, issues related to taxation, business permits and licensing, and access of SMEs to financing and technology were the most common concerns raised that beset the private sector’s readiness for and competitiveness under AEC [Asean Economic Community],” Yao said. “There is a need for the government and private sector to heed the adoption of an industrial road map for Philippine industries to be able to compete with the forthcoming Asean integration. This should mainstream the enhancement of a competitive business environment, where SMEs are able to participate effectively and benefit from the global production network being built by Asean with its trade partners and important export markets,” he added. Citizenwatch is an independent network of professionals, which advocates for the interests of not just the less privileged sector, but also of society as a whole whose mission is to stand up against powerful interests whenever they curtail the citizens’ right to health, safety, financial security and right to fully participate in democratic society. Yesterday, a friend and former classmate at UPSE, now President of the National Power Corp. (NPC), Gladys Cruz Sta. Maria, posted a photo in fb, of an inter-agency Technical Working Group (TWG) meeting of the National Water Resources Board (NWRB). In particular, they discussed about the still low level of Angat Dam. Yesterday, the dam elevation was only at at 178 meters above sea level (masl). The same day last year, the level was at 203.1 meters. 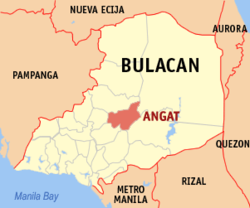 Angat dam – opened in 1967 in Norzagara, Bulacan, owned by Napocor -- is the main source of household and commercial water use in Metro Manila, Bulacan and nearby provinces. The Angat reservoir has a total capacity of 850 M cubic meters. I asked Gladys for data re how much is water draw out or release for Metropolitan Waterworks and Sewerage System (MWSS) use. 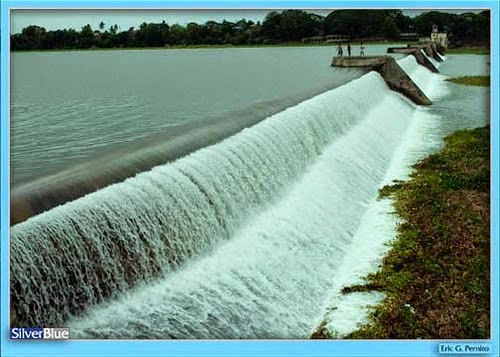 If the water storage area and capacity of Angat remains the same all these years but water withrawal for household and commercial use keeps rising yearly, then the water level will always be below its levels in previous years. NWRB's normal allocation to MWSS is 46 cubic meters per second (cms), equivalent to 165,600 cubic meters per hour or 3,974,400 cubic meters per day. On annual basis, MWSS receives 1,450.656 million cubic meters per year from Angat dam/reservoir. The average yield of the watershed is only 58 cubic meters per second, plus average Umiray diversion of 12 cubic meters per second. Water rights of NIA is 36 cubic meters per second, while MWSS is allocated 46 cubic meters per second 24/7/365. In the long run, year to year basis, plus El Niño, the reservoir cannot store enough water to supply irrigation and domestic water supply. Unlike before, power gen is now just dependent on the alloc of NIA and MWSS. I thanked Gladys for those numbers. For me, this implies one thing -- we need more dams. Water is not a problem in the Philippines (or elsewhere) and will never be. So many people die and so much properties are damaged yearly because of too much flood, too much water. The problem is lack of dams to collect and store those excess water. So before some groups will say "water crisis" or "water fight due to man-made climate change", they should realize that Angat alone will never be able to supply the rising water needs of the rising population. As I posted On MERS CoV and OFWs last May 08, 2014, my sister in law, Gemma B. Oplas, died last May 6, 2014 of the disease. She was an ER nurse at King Fahad Medical City (KFMC) in Riyadh, the biggest Saudi government hospital in that city. 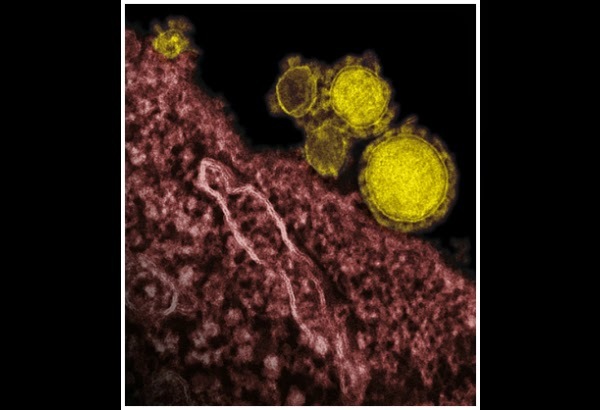 She was attending to a MERS patient, and within days, she herself was infected. Death was fast, only 6 1/2 days after she was confined. It is now 3 months and 3 weeks since she died and her body is not flown home yet, it is still in a freezer in Riyadh. 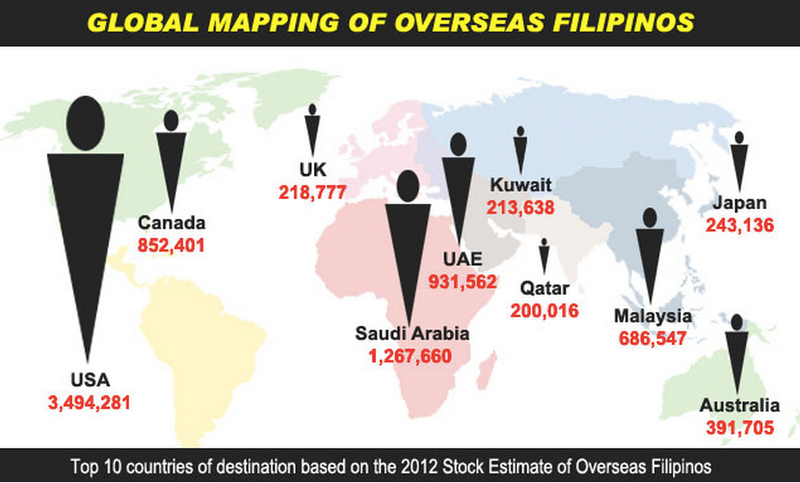 That is one of the hard travails of OFWs who died of infectious diseases abroad. I am not aware of the science of containing viruses, but refrigeration for more than 3 months is supposed to be enough to kill any virus in the body. If cremation is only allowed in Saudi Arabia, but it's not. Two weeks ago, KFMC and the Saudi government have decided to send home Gemma's body via Cathay Pacific cargo (Riyadh-HK-Manila) and Gemma was supposed to arrive in Manila last August 17, Sunday afternoon. But a belated correspondence from Cathay Pacific the day before said that HK government and Cathay would require an "import permit" from my brother (in Negros Occ.) before the airline will transport the remains. Import permit for the dead???? Cathay said this permit should come from the DOH, that it is safe to bring home the body of a deceased person who died of that infectious disease. It's weird. I asked my friend, DFA ASec Eddie about it and it is also his first time to hear a case of requiring an import permit for the dead. People have high stigma against this disease. Like (1) the managers of the funeral park in Cadiz City, Neg. Occ. who adviced that Gemma be cremated in Bacolod instead of being buried in Cadiz (64 kms. north of Bacolod), (2) DOH Bacolod which will not allow opening the casket and wants the body to be buried quick, (3) various airlines including Cathay, and (4) the HK government. I went to DOH Bureau of Quarantine (BoQ) last week, August 20. I was able to talk to its Director, Dr. Mavic Vasquez. She said it is not their duty or responsibility to give a permit for incoming deceased people. They can give for outgoing ones. She thought that it should be DFA Riyadh, with Saudi Ministry of Health (MOH), that should issue such permit. A dead person here (Filipino or foreigner) that must be transported abroad for burial or autopsy or whatever purpose, the BoQ issues the permit to transport. I called up again the DFA Office of the UnderSecretary for Migrant Workers Affairs (OUMWA). The person I spoke there wanted to call Cathay Pacific as DFA guys themselves are surprised with this new requirement. He called the Riyadh Philippine Embassy (PE) instead to inquire what the problems are. He was informed that there may be some problem with the Saudi MOH, but the PE is doing something to hasten the repatriation of Gemma's body. "...If not cremated, death Certificate + Undertakers Certificate. If death caused by communicable disease, admittance allowed only when the remains is cremated or properly embalmed and enclosed in hermetically sealed coffin." So their earlier requirement of an "import permit" was irrelevant as the HK government wants an Undertaker's Certificate + proper enclosure in a sealed coffin. 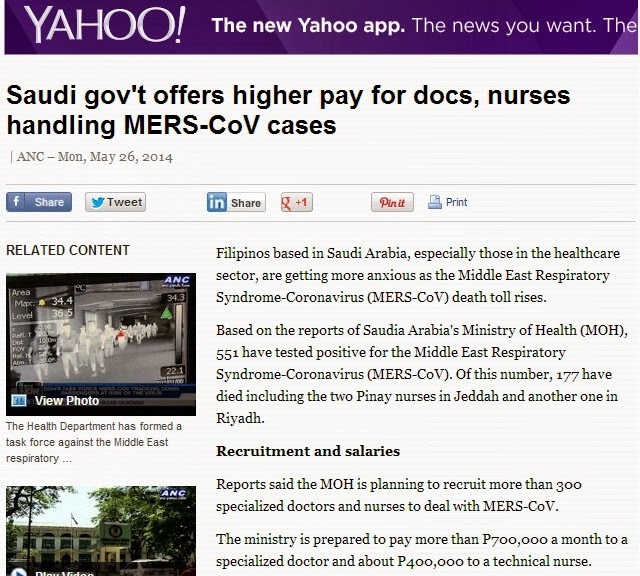 In one yahoo report last May 26, 2014, the Saudi government expressed high alarm, even desperation, in attracting health professionals who will risk their lives attending to MERS patients. Gemma's death benefit package from the hospital is not released until now. There are some bureaucracies in the Saudi government and my brother is asking the assistance of the Riyadh PE. All the papers for OWWA benefits, SSS, etc. cannot start unless there is a death certificate or at least Report of Death from DFA Riyadh embassy. The Report must come with the body, so the longer that the body is not repatriated, the longer will be the non-processing of said papers. There must have been several OFW health workers who died of MERS-CoV in Saudi alone this year. Some must be there until now. It is really hard for the immediate family, like my younger brother and their only child, 13 yo Lois. to endure these uncertainties. Lots of stigma attached to this disease, but it is not the victims's fault. Gemma died in the course of her work, she was an ER nurse there. I think media alarmism and sensationalism has fanned this public stigma. Next problem would be OFWs who died of ebola, if any, in Africa. The same public stigma, or even worse, would be attached to the victims. One reason why many Filipino relatives and family members of OFWs who died of MERS are silent. They seldom, if any, admit publicly that their kin died of that disease. I think there are other weird stories in bringing home OFWs who died of infectious diseases, but since many of the kins here are not too open to reveal it publicly, the stories are kept in the dark. I don't think they should be ashamed to admit that their kin died of an infectious disease, especially while performing their profession. If their kin stole abroad and was shot and killed, then there is a reason to be ashamed. 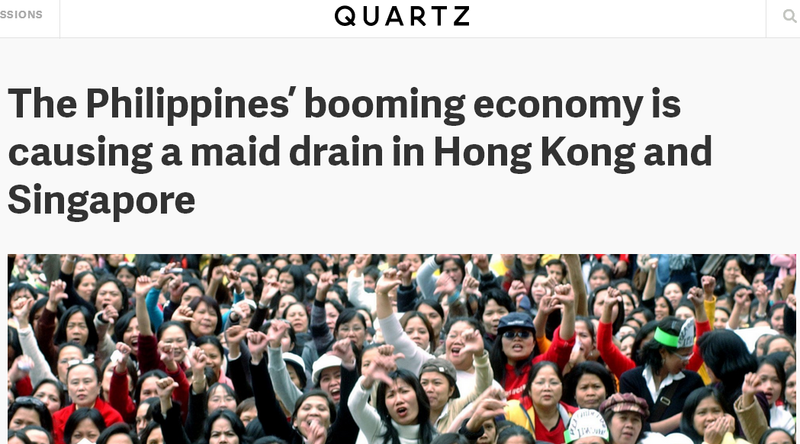 I shared this story from Quartz (posted August 21, 2014) in my facebook wall a few days ago with a note, "Magagalit ang mga anti-government groups dito. They will not believe this news." Today it has 23 shares, wow. This means that many people like to hear positive news too, not just the negatives. The article showed these 3 charts. SM North Edsa in Quezon City is the 3rd biggest mall in the world I think. This SM Seaside Mall in Cebu will be the 4th largest, to be opened next year. A friend who saw it says it is "massive". From the other photos I saw, there are at least seven cranes working simultaneously. 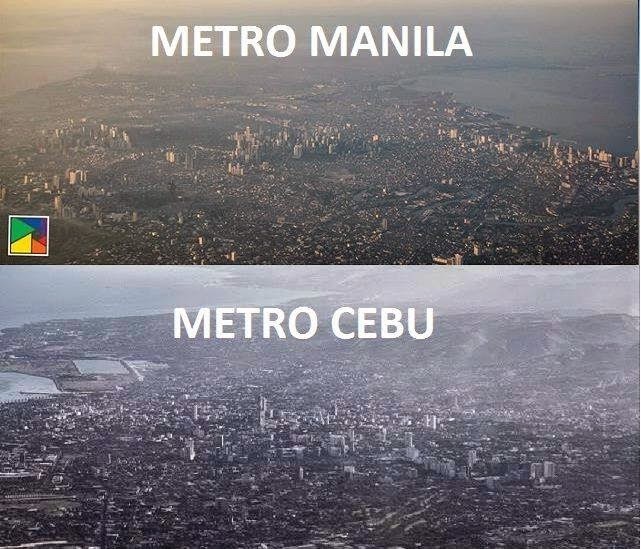 Photos below I got from the Philippine Construction Boom facebook page. Hundreds of construction workers now have jobs. Once it's done, thousands of sales people, small and medium entrepreneurs (some jobs outsourced with micro entreps), delivery people, etc. will have continuing jobs. 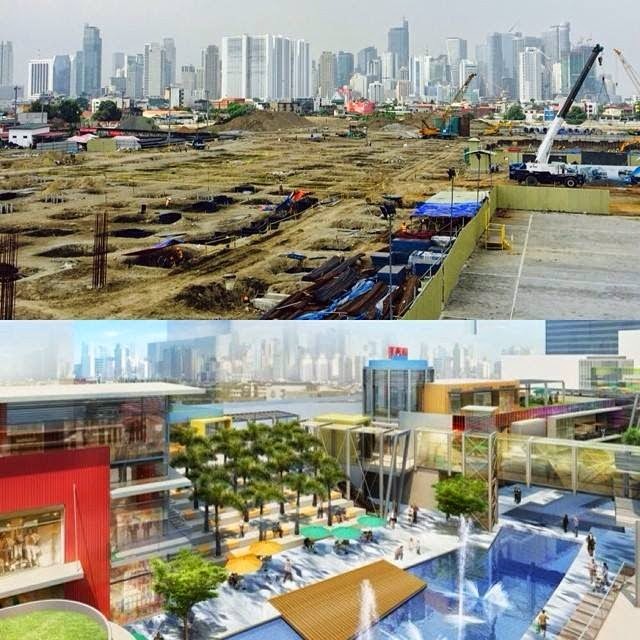 changing skyline of makati. The Circuit. Former Sta. Ana racetrack. NAIA terminal 3 and Makati skyline. 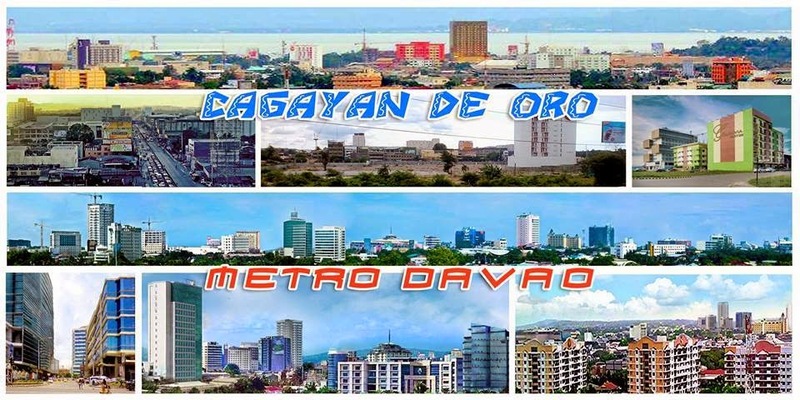 It seems CDO and Davao cities in Mindanao are business-friendly and attracting good investments too. 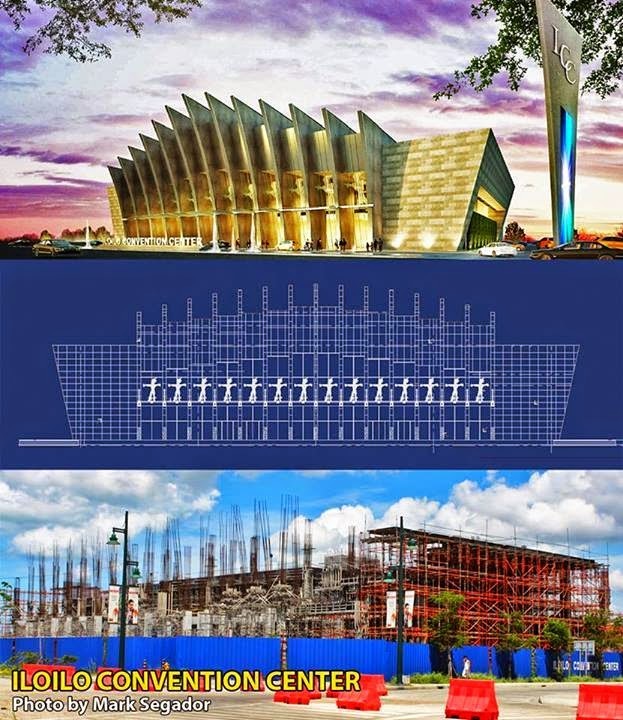 The Iloilo Convention Center is projected to be finished by March next year. The Asia Pacific Economic Cooperation (APEC) Summit next year will be held there. 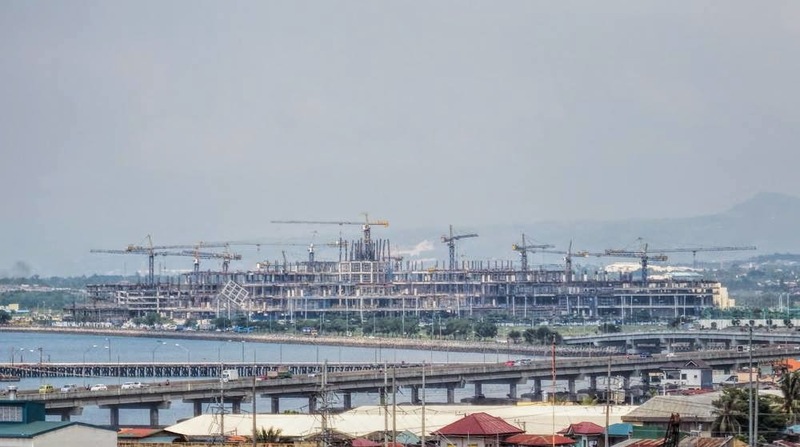 The old airport, replaced by a new one in 2007, is a construction site, where developer Megaworld Corp. is building a 35 billion-peso ($800 million) business park with a Marriott hotel and condos sporting names like One Madison Place and Lafayette Park Square. A mile down the road, the planned hospital, shops, hotel and homes of Ayala Land Inc.’s Atria Park District may create 10,000 jobs on former salt pans. For Ilonggos and Ilonggas, as the city’s residents are known, the growth brings new opportunities. From Manila Standard, QC to host half km-high tower, June 27, 2014. 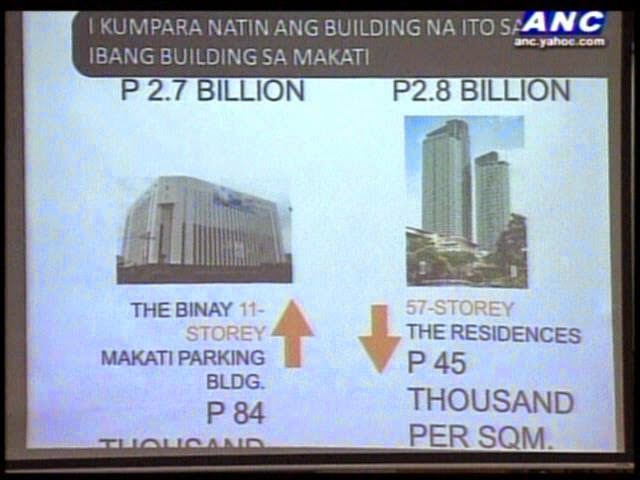 612 meters high, 200 floors, to rise in QC, wow. Eto rin, sikat sa makati, hehe. Anyway, the photos above are not meant to glorify the state or PH government. Rather to show that despite various adversities like heavy business bureaucratism, the local private sector along with their foreign parners, local workers and SMEs, are simply too optimistic and hopeful about the country. Thus, those huge business initiatives. 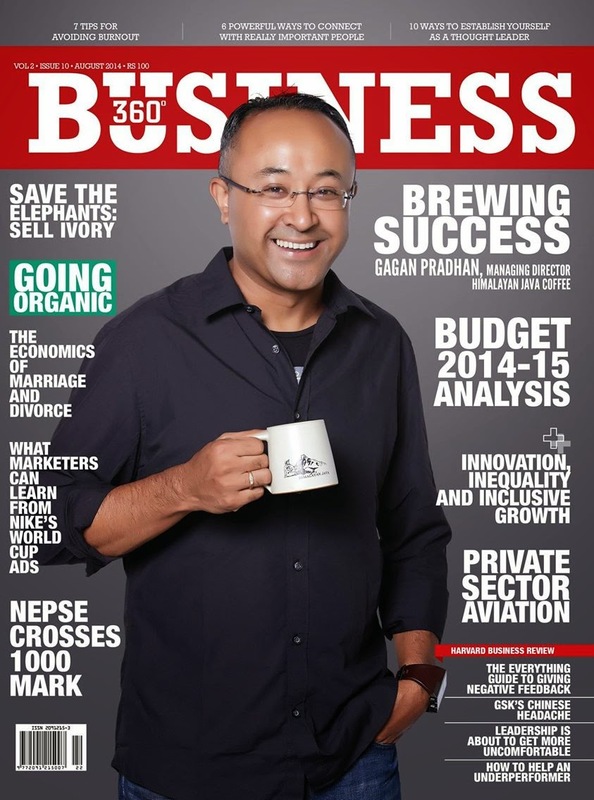 * This is my article for August 2014 in a business paper in Kathmandu, Nepal. Social and economic inequality is a political and emotional issue that continues to chase mankind from its most primitive state to its current modern and information-driven lifestyle. 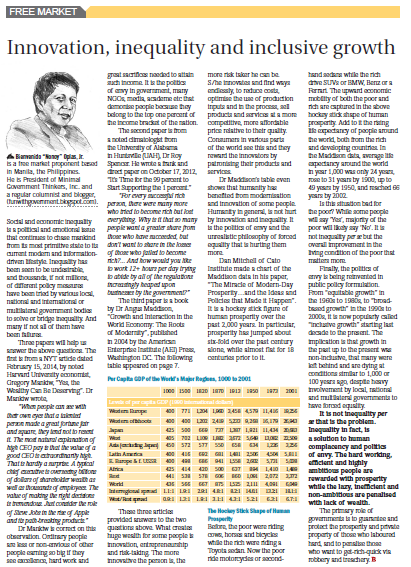 Inequality has been seen to be undesirable, and thousands, if not millions, of different policy measures have been tried by various local, national and international or multilateral government bodies to solve or bridge inequality. And many if not all of them have been failures. What creates inequality? Or better yet, what creates wealth that allows others to earn so much compared to the rest of humanity? Dr. Mankiw is correct on this observation. Ordinary people are less or non-envious of other people earning so big if they see excellence, hard work and great sacrifices needed to attain such income. It is the politics of envy in government, many NGOs, media, academe, etc. that demonize people because they belong to the top one percent of the income bracket of the nation. "For every successful rich person, there were many more who tried to become rich but lost everything. Why is it that so many people want a greater share from those who have succeeded, but don’t want to share in the losses of those who failed to become rich?... And how would you like to work 12+ hours per day trying to abide by all of the regulations increasingly heaped upon businesses by the government?" The third paper is a book by Dr. Angus Maddison, Growth and Interaction in the World Economy: The Roots of Modernity, published in 2004 by the American Enterprise Institute (AEI Press, Washington DC. The following table appeared on page 7. These three articles provided answers to the two questions above. What creates huge wealth for some people is innovation, entrepreneurship and risk-taking. The more innovative the person is, the more risk taker he can be. He/she innovates and find ways endlessly, to reduce costs, optimize the use of production inputs and in the process, sell products and services at a more competitive, more affordable price relative to their quality. Consumers in various parts of the world see this and they reward the innovators by patronizing their products and services. 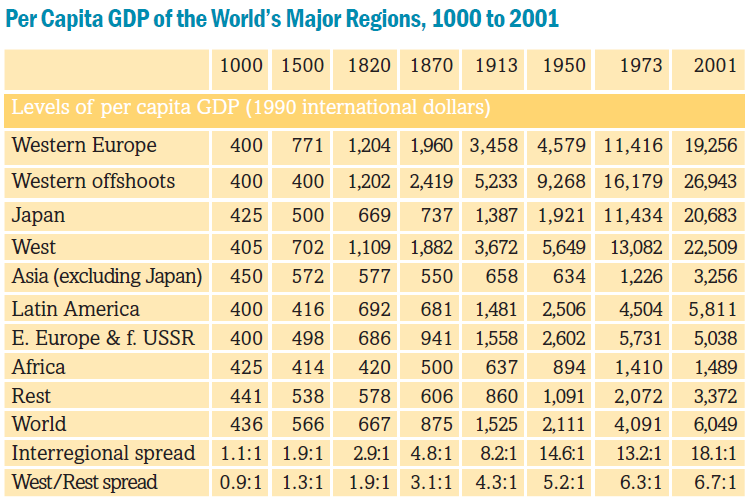 Dr. Maddison’s table even shows that humanity has benefited from modernization and innovation of some people. Humanity in general, is not hurt by innovation and inequality. It is the politics of envy and the unrealistic philosophy of forced equality that is hurting them more. Dan Mitchell of Cato Institute made a chart of the Maddison data in his paper, The Miracle of Modern-Day Prosperity…and the Ideas and Policies that Made it Happen. It is a hockey stick figure of human prosperity over the past 2,000 years. In particular, prosperity has jumped about 6x over the past century alone, while almost flat for 18 centuries prior to it. Before, the poor were riding cows, horses and bicycles while the rich were riding a Toyota sedan. Now the poor ride motorcycles or second-hand sedans while the rich drive SUVs or BMW, Benz or a Ferrari. The upward economic mobility of both the poor and rich are captured in the above hockey stick shape of human prosperity. Add to it the rising life expectancy of people around the world, both from the rich and developing countries. In the Maddison data, average life expectancy around the world in year 1,000 was only 24 years, rose to 31 years by 1900, up to 49 by 1950, and reached 66 years by 2002. Is this situation bad for the poor? While some people will say Yes, majority of the poor will likely say No. It is not inequality per se but the overall improvement in the living condition of the poor that matters more. Finally, the politics of envy is being reinvented in public policy formulation. From “equitable growth” in the 60s to 80s, to “broad-based growth” in the 90s to 2000s, it is now popularly called “inclusive growth” starting last decade to the present. The implication is that growth in the past up to the present was non-inclusive, that many were left behind and are dying at conditions similar to 1,000 or 100 years ago, despite heavy involvement by local, national and multilateral governments to have forced equality. 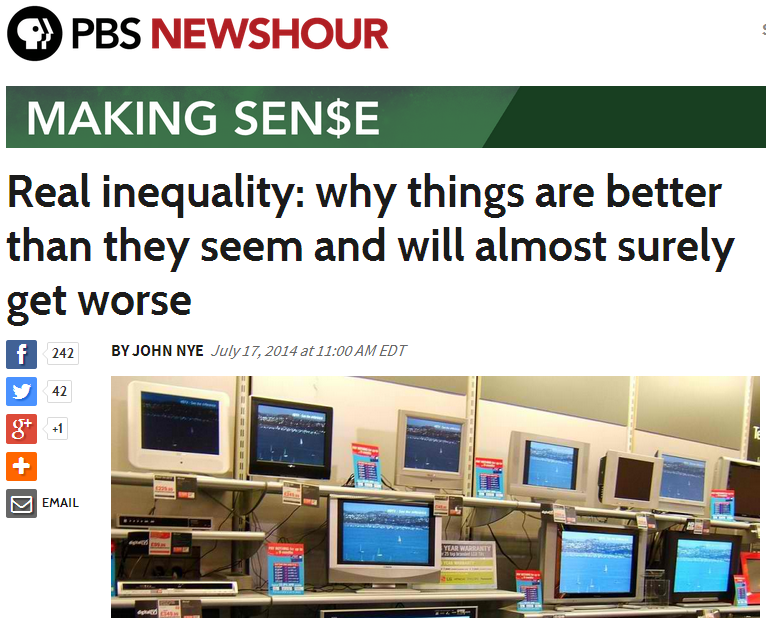 It is not inequality per se that is the problem. Inequality in fact, is a solution to human complacency and politics of envy. The hard working, efficient and highly ambitious people are rewarded with prosperity while the lazy, inefficient and non-ambitious are penalized with lack of wealth. The primary role of governments is to guarantee and protect the prosperity and private property of those who labored hard, and to penalize those who want to get-rich-quick via robbery and treachery. The Economic Freedom Network (EFN) Asia will hold its annual conference this coming November 6-7, 2014 in Hong Kong. The theme is very timely, 'Liberalism: promoting growth, reducing inequality'. EFN annual conferences are sponsored by the Friedrich Naumann Foundation for Freedom (FNF), in partnership with a local think tank/s of the host city in Asia. So for this conference, the Lion Rock Institute (LRI), Hong Kong's first free market think tank, will be the co-sponsor. Among the prominent speakers will be HK Finance Secretary John Tsang, a high official from the FNF headquarter in Germany, the FNF Regional Director for East and Southeast Asia (incoming) Siggi Herzog, who replaced Rainer Adam who has been promoted to head the FNF Regional office for east and central Europe. Rainer has splendidly solidified a mass base among political parties and independent think tanks and individual scholars in Asia in advancing the philosophy of liberalism and individual liberty, free market and rule of law, tolerance and human rights. Other prominent speakers will be Fred McMahon of the Fraser Institute in Canada, who will discuss the results of the Economic Freedom of the World (EFW) Report 2014. Also Tom Palmer of the Atlas Economic Research Foundation in the US, Barun Mitra of Liberty Institute in India, Wan Saiful Wan Jan of the Institute for Democracy and Economic Affairs (IDEAS), the first and only free market think in Malaysia. I think IDEAS is also the biggest and most dynamic free market think tank in the ASEAN. It will be a largely think tanks' event on November 6th to morning of 7th. In the afternoon, there will be a joint session with the Council for Asian Liberals and Democrats (CALD), the network of political parties and politicians advocating liberal and democratic ideas, also sponsored by the FNF. Friends and readers, I urge you to attend this forum on November. It is open to the public, even if they are not members of the network, just pay for your own hotel and plane fare. Registration fee is normally waived. About inequality, may I share here four useful materials. 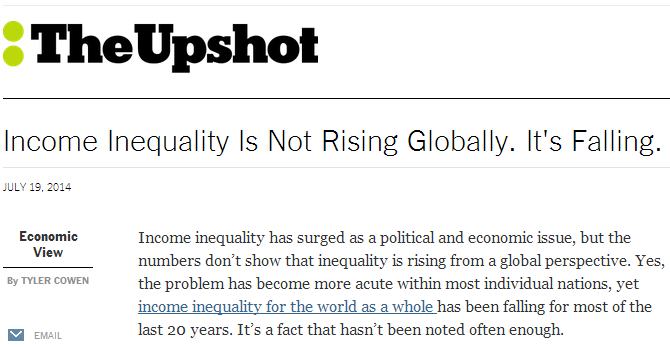 "I make two claims: that in a very fundamental sense, real inequality has almost certainly declined over the last few decades, despite the problems brought on by the financial crisis, but that improvements due to stronger growth, productivity, and higher incomes will only alleviate some of our concerns while exacerbating the perceptions of inequality — perceptions that I predict will surely grow in the coming decades." John further argued that technological advancement has benefited the poor and hence, reduced social and economic inequality because the price gap of personal computers, cell phones and TVs has declined, allowing the poor to have more access to more information. "Fiscal stimulus is one important aspect but there are others such as export promotion and removal of barriers to private investment that are important to achieving increased output and employment." Yes, remove or abolish barriers to investments and we will have more investments, more job creation. When more people have jobs, inequality is reduced, or at least the condition of the poor improves, as they work their way up. "...globally minded egalitarians should be more optimistic about recent history, realizing that capitalism and economic growth are continuing their historical roles as the greatest and most effective equalizers the world has ever known." 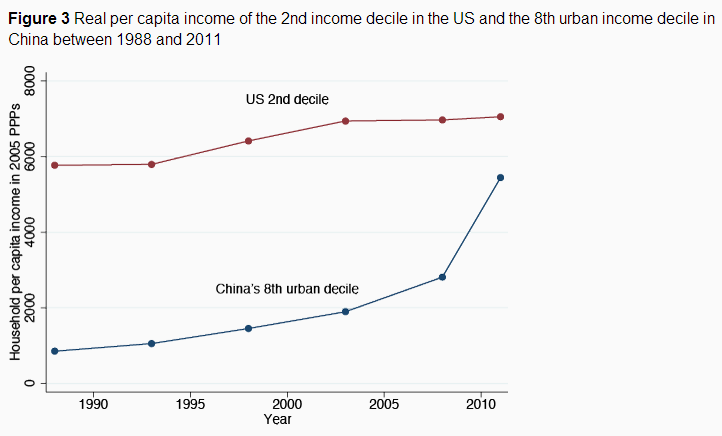 "Indeed we are comparing relatively poor people in the US with relatively rich people in China, but given the income differences between the two countries, and that the two groups may be thought to be in some kind of global competition, the comparison makes sense." Ultimately, governments must liberate the poor -- liberate them from too many burdensome business bureaucracies and taxes, and liberate them from entitlement and welfare dependency from the state and politicians. The poor can stand up on their own, they are rational. If there are incentives to more entrepreneurship, they will become micro or small entrepreneurs, but if there are incentives to dependency, then they will become complacent and welfare-dependent. On another note, there will be an Economic Freedom of the World (EFW) Network, Annual Conference this coming October 5-7, 2014 in Brussels, Belgium. The theme of the conference will be "Does the EU enhance Economic Freedom in Europe?" and it is jointly hosted and co-sponsored by Dialogue Programme Brussels, FNF, and The Fraser Institute. This news report last August 8, 2014, was posted with discussion by Atty. Joey Ochave at the Medicines Transparency Alliance (MeTA) Philippines email loop. Joey is the Vice-Chairman of MeTA Philippines, SVP of Unilab, and a friend way back in UP Diliman undergrad in the 80s. Here is Joey's discussion. Posting this with his permission. It is a well-written, well-argued piece as always, which many people outside of MeTA would be interested to learn. My short comments and Joey's reply further below. A bit long, about four pages, enjoy. I came across the attached article entitled “Pharmaceutical firms seek full implementation of generics law” in Philippine Star last August 8th. It mentions a forum in Manila where three companies called “for the government to strengthen the [Cheaper Medicines Act’s] implementation to allow drug outlets to carry a variety of medicine brands, including those sourced through parallel importation, and give choices to consumers.” (emphasis supplied) The three companies were raided by the National Bureau of Investigation agents for alleged “violation of infringement on patent rights” (sic) and selling “illegal drugs”. They argue that since their drugs have been registered with the FDA, they are “not illegal”. 1. I asked around and learned that the drug molecule in this case is etoricoxib. This medicine is indicated for “acute and chronic treatment of signs and symptoms of osteoarthritis and rheumatoid arthritis; treatment of ankylosing spondylitis; acute gouty arthritis and primary dysmenorrhea; relief of acute pain; moderate to severe acute pots-op pain associated with dental surgery and abdominal gynaecological surgery.” It comes in two strengths – 30 mg. and 60 mg. (MIMS, 135th Ed., 2013). It is marketed in the Philippines as Arcoxia® by Merck Sharp & Dohme (MSD), who I believe is also the patent owner or at least authorized by the latter. 2. The etoricoxib molecule has a valid and subsisting patent in the Philippines. The patent is on the molecule itself. It is therefore not a frivolous patent, which the Cheaper Medicines Law (CML) prohibits. 3. Sec. 72 of the CML amended the Intellectual Property Code of the Philippines to allow parallel importation. The patent owner does not have the right to prevent third parties from importing a drug or medicine that has been “introduced in the Philippines or anywhere else in the world by the patent owner.” (emphasis supplied) By inserting the phrase “anywhere else in the world”, the Philippines adopted the “international exhaustion” principle, which means that if the patent owner sells the patented product anywhere in the world (not just in the Philippines), his patent rights over the patented product is exhausted. He cannot subsequently prevent the buyer of the patented product from selling or importing it into the Philippines. To illustrate, if patent owner X sells his patented medicine to Company Y in Thailand and the latter sells the product to Company Z in the Philippines, Company X cannot prevent Company Z from importing and selling the patented medicine in the Philippines. Why? Because Company X has exhausted its patent rights over the patented product when it first sold it to Company Y in Thailand. Stated differently, a patent owner loses his patent rights over a specific patented product the first time he sells the latter. It is also called the “doctrine of first sale”. The policy rationale behind this rule is that the patent owner has already recovered whatever economic benefits he is entitled to as a patent owner when he first sells the product. In short, kumita na siya when he made the first sale. 4. The article mentions “parallel importation”. I do not know whether this is because the three companies believe they are engaged in parallel importation. In parallel importation, however, what may be imported is only the product of the patent owner. This means one can only import Arcoxia® or any etoricoxib brand manufactured or authorized by MSD. It is not parallel importation if one imports a generic etoricoxib because it did not come from MSD. Again, under Sec. 72 of the CML only the product placed in the market by the patent owner anywhere in the world can be parallel imported into the Philippines. If one imports the generic equivalent of Arcoxia®, this means it was not MSD who placed it in the market and MSD has not derived economic benefit from it. It therefore patent infringement if you import the generic etoricoxib into the Philippines. Hindi siya parallel importation kapag generic equivalent ang inangkat. 5. The three companies also argue that since they were able to secure Certificates of Product Registration (CPR) from the FDA for their etoricoxib product, they are free to sell the same in the Philippines. No, that is not true. They should still have to make sure that they are not infringing upon the IP rights (trademarks and patents) of others. The FDA has nothing to do with patents. Patents are with the IPO. The role of the FDA is simply to make sure that the medicines you will market in the Philippines are safe, effective and of good quality. (This task is no joke given the proliferation of substandard medicines in the world.) This is why the CPRs issued by the FDA state that the CPR holder holds the FDA free and harmless from any damage resulting from any trademark or patent infringement suit against the CPR holder. 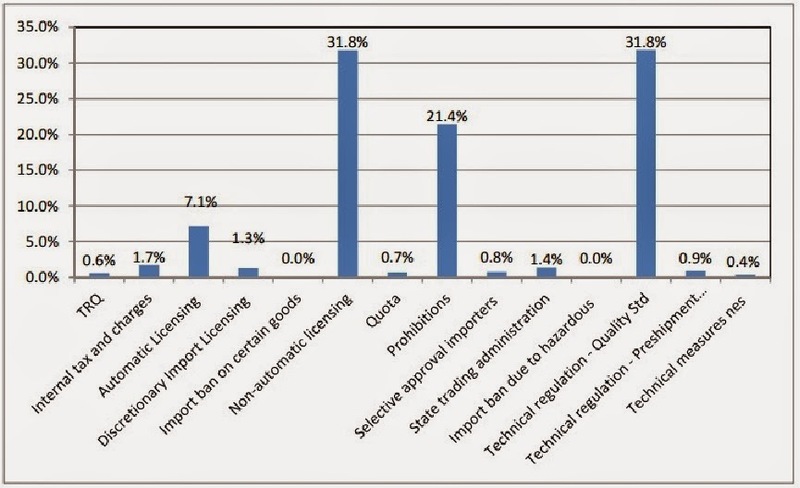 This means that there is no linkage between drug registration and patents. This is what public health advocates fought for several years ago, which the then BFAD accepted. (Malaysia and Indonesia Drug Regulatory Authorities followed suit.) Unfortunately, with their argument the three companies are unwittingly arguing for patent linkage. (Offhand, I don’t think they realize the implications of their argument.) In any case, for the nth time, patent linkage is NOT required by the TRIPS Agreement. It is in fact a TRIPS Plus provision, or one that it not required by the World Trade Organization. The WTO Doha Declaration on TRIPS and Public Health itself (aside from WHO) encourages developing countries to exercise the public health flexibilities afforded by the TRIPS Agreement. Removing any linkage between patents and drug registration is one of those flexibilities. Kapag naman ibinalik pa natin ‘yan, tayo na ang may problema. Sinabi na nga ng WTO that developing countries like us should make use of TRIPS flexibilities to protect public health, eh. Long-term unemployment means people who are unemployed for 12 months or more. The number is big in Europe, around 12.5 million people in the European Union, of which around 9.5 million are in the Eurozone area, according to this paper by the Economic Policy Viewpoint, March 2014. 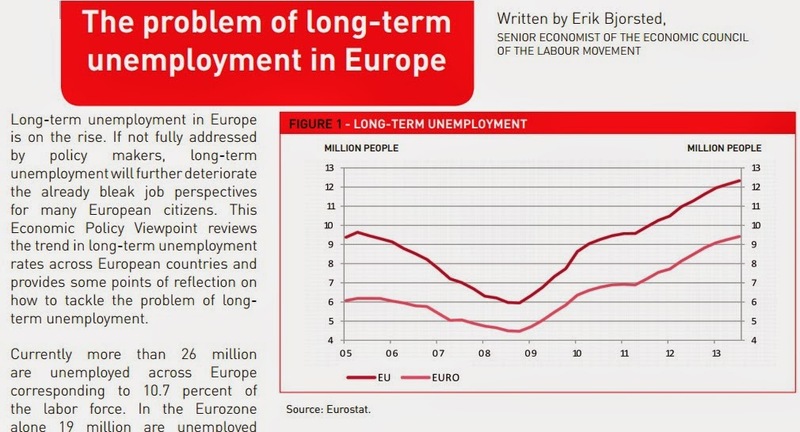 Including the short-term unemployed, some 26 million Europeans are unemployed. EU countries generally have rigid and strict labor policies, the "exensive to hire, difficult to fire" policy. I like somehow the "flexicurity" policy in Denmark, sort of "easy to hire, easy to fire" labor policy, which actually works both for workers and employers. Many European countries have those rigid "pro-labor" laws that make it difficult for employers to just fire workers. What do the employers do? They hire as few people as possible. Instead of hiring 3 or 5 workers, they hire only one. Give that one worker high salary, lots of trainings, travels, gadgets and car, nice housing and healthcare package, to keep his/her productivity high, and this worker will do the job of 3 or 5 people. He/she is lucky with all the high pay and many benefits. The others aspiring to be hired, sorry na lang sila. They can aspire to become start up entrepreneurs, hire themselves. But the business bureaucracy and multiple taxes, fees and mandatory contributions in Europe is not exactly something that many people would wish to experience. And that largely explains why unemployment rate in France and many EU countries is always high. The labor unions, they can demand as much as they can, like shorter than France's 35 hours work week, minimum wage of $50/hour, 4-5 months vacation leave with pay, and so on, and all their demands can become laws. There are several possibilities that can happen. One, I mentioned above, employers will get as few workers as possible and get more robots and computers to assist those few hired workers. Two, some employers will simply shut down operation in Europe and move to Asia or Africa or S. America. The best workers' antidote to capitalism is for them to become start up entrepreneurs and capitalists themselves. If their former employers will not give them $50/hour pay, 34 hours/week or less work, etc., they should give that to themselves, as entrepreneurs. Let us see if they can walk their talk. And one thing I notice, the more productive, more ambitious, more hard working employees and staff are not interested in joining "strong" labor unions. Why? Because they have zero intention to become workers or employees forever. Rather, they intend to become start up entrepreneurs soon. They endure "slave work" like 12-14 hours a day (60-70 hours a week) because they learn more things, more details and more tricks, how big and successful companies operate. Or if they remain as employees, they move to multinational firms as mid-level managers and directors and they travel the region, if not the world. It is those who intend to become workers forever that tend to gravitate to militant labor unionism. 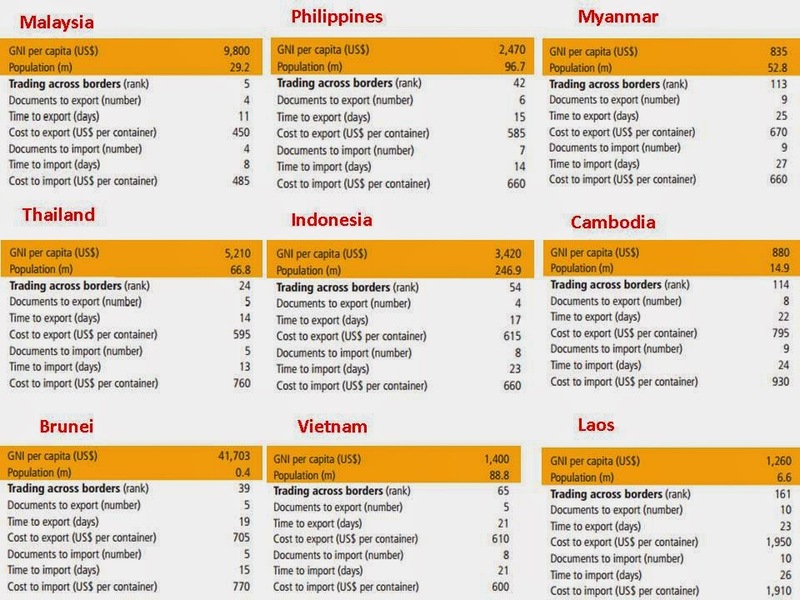 This is my paper presented during the Stratbase Forum on ASEAN Competitiveness last July 23, 2014 in Makati, organized by Stratbase Research Institute (SRI). SRI also published this today and circulated to their friends and clients. The 11-slides presentation including 9 tables and 2 charts is posted in my slideshare wall. I am posting 4 of 9 tables and 2 charts here. 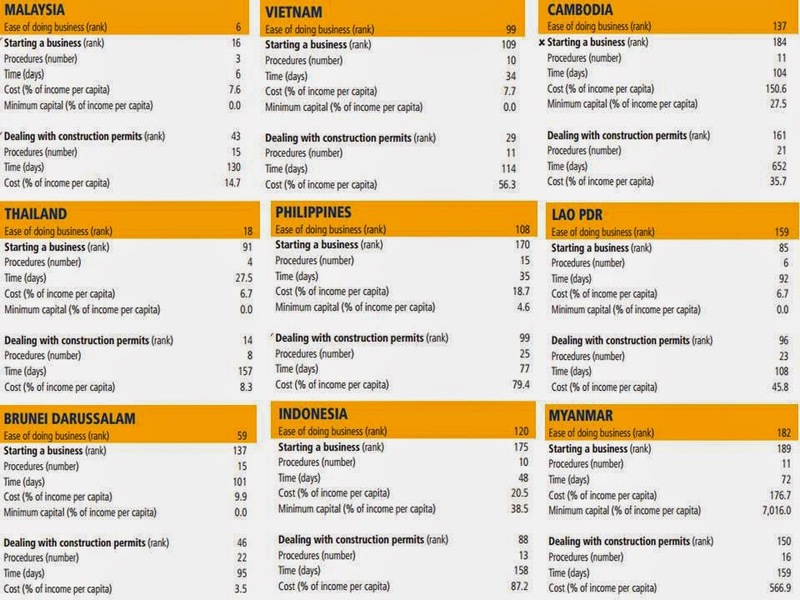 Source: KPMG, 2013.ASEAN Tax Guide, Overview, p. 10. Table 3. Ease and Unease in Starting a Business and Getting Construction Permits in ASEAN-9. ASEAN 5 - Indonesia, Malaysia, Philippines, Singapore, Thailand. Table 6. 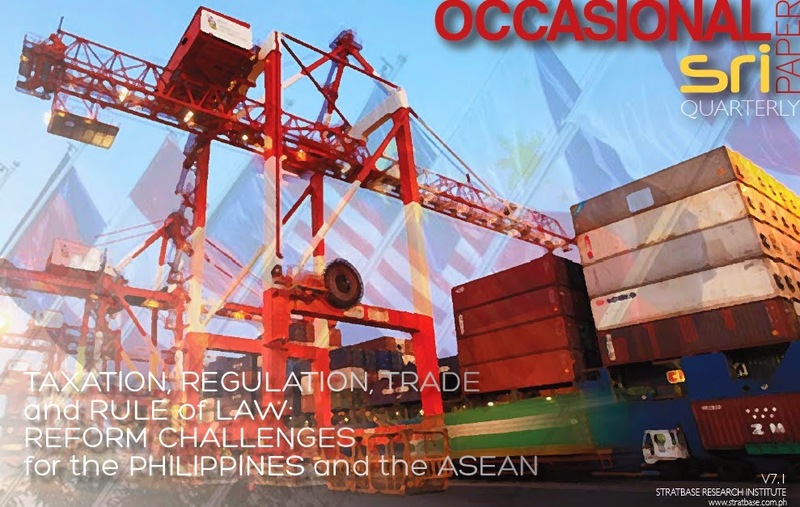 Ease or Unease of International Trade, ASEAN-9. 5. To encourage economic competitiveness of the Philippines and the rest of ASEAN, they need less taxation and business regulations, more trade and rule of law. This report is confusing. It says, "Psalm said Napocor incurred stranded contract costs (SCC) amounting to P4.1 billion in 2013... Last year, Psalm proposed a P0.13 per kilowatt-hour increase in the SCC after Napocor incurred P17.69 billion in obligations from 2011 to 2012." 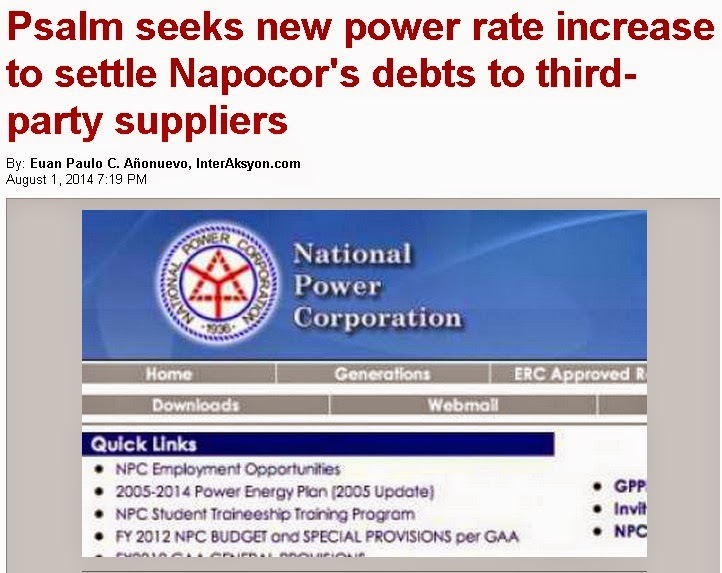 I checked with the National Power Corp. (NPC), it already has net income since 2012. Its 2013 net income is P500+ M. The Power Sector Assets and Liabilities Management Corp. (PSALM) is referring to old NPC loans especially during the power crisis of the early 90s when the Independent Power Producers (IPPs) put up quickie power plants that charged high just to solve the daily brownouts during that time. So those are old NPC loans transferred to PSALM, the latter borrowed money to pay those obligations. Now PSALM wants to increase the universal charges (UC) in our monthly electricity bill so it can pay those transferred debts. Deka-dekada na ang mga utang na yon ng NPC, di pa bayad until now. That’s how big NPC debts are. I remember NPC was losing money or incurring debts something like P50 B a year in the 90s. This should be a lesson for people who campaign for "Back to government control of power generation" and "Junk EPIRA". When government is a player, it has little or no incentive to be efficient. Their cost of operations, no matter how high or bloated, is “pre-paid” with subsidies via annual Congressional appropriations. If they get into deep s__t of debts, it’s not them that will pay but the national government (NG) or other specialized government agencies. In this case, it is NPC debt to PSALM debt. We will pay for those debts later via higher taxes, or higher electricity/utility bills. There should also be no NG guarantees for debts by government corporations and financial institutions. If LRTA, PNCC, NFA, etc. keep borrowing as if money to pay someday will come from Batman and Spiderman, their debt should not be guaranteed. That means they must become bankrupt someday. NFA keeps piling debt until now, estimated around P155 B already. Since these are guaranteed debt by the NG, ultimately those debt will become part of DOF debt, and annual interest payment will rise even higher, very soon. But if NG will not guarantee debts by govt corporations like NFA, PSALM, LRTA, etc., no one will lend to these state corporations. 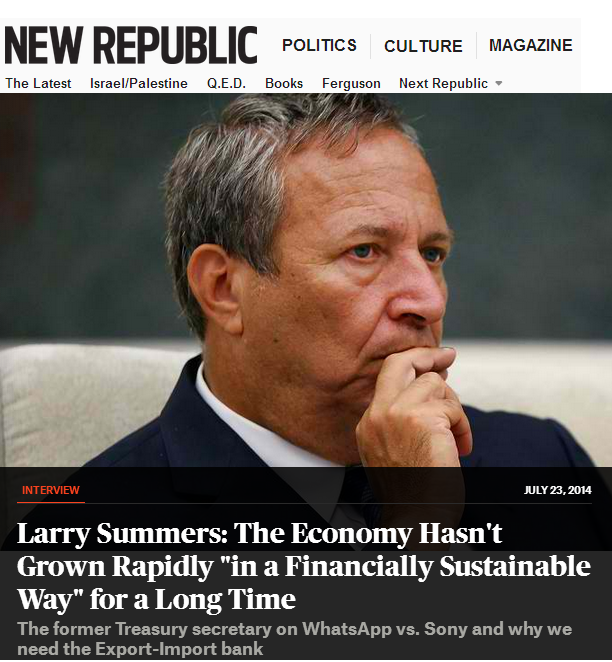 Private lenders know that these corporations are undisciplined, spend-spend-spend entities. They only know how to borrow but do not know how to pay. That is why many if not all government corporations should be privatized soon. Use the proceeds to pay many of the public debt. Meanwhile, some old notes below. Long daily brown outs in Mindanao last March-May, the main culprit is that Mindanao exempted themselves (through the politicians there) from EPIRA. All hydro power plants in Luzon were privatized and became efficient, participating at WESM. Whereas All hydro power plants in Mindanao remain in govt hands and remain not so efficient. They are also not connected to the national grid. The Mindanao power problem is not a new "crisis" that requires an “emergency power” from the President, but an annual scourge. Unfortunately, some people think that more government, more bureaucracies, will produce more power plants. It should be the opposite. Less bureaucracies will produce more power plants. A friend once commented that "renewable energies (REs) are not favoured by the government." This is not true. The average generation charge of coal, nat gas, geothermal, big hydro, is around P5/kWh or less. Including the use of peak-load diesel plants during peak hours makes the generation charge around P5.50/kWh. Yet the feed in tariff (FIT) or guaranteed min. rate for solar is P9.68/kWh, wind is P8.53/kWh. The solar and wind can sell at P12 or P20 or higher if supply is tight, but the FIT is the guaranteed minimum for them, which is almost 2x the ave price of conventional power. In addition, REs have renewable portfolio standards (RPS). If conventional power plants bid at WESM, they must bid zero or P1 so they can be dispatched by WESM. REs however, can bid at FIT level and they are assured almost 100 percent of being dispatched by WESM. The RE law of 2008 is clear favoritism of REs. Now DOE has increased the allocation for REs. Solar from 50 MW to 500 MW. Wind rose to also 250 or 500 MW. * This is my article yesterday in interaksyon.com. Overall, the President's State of the Nation Address (SONA) was good. More statesman-like, less combative. He mentioned several liberal and free market-leaning policies, which is good and consistent with his party affiliation. But there was also an overall hangover belief that government can do and will do almost everything for the people. 2. More labor conciliation via Department of Labor’s Single entry Approach (SEnA), resulting in less strikes and industrial conflict, which will help attract investors. 3. More competition and less monopolization in Department of Public Works and Highways (DPWH) project contracts after the removal of letter of intent in public works bidding. 4. 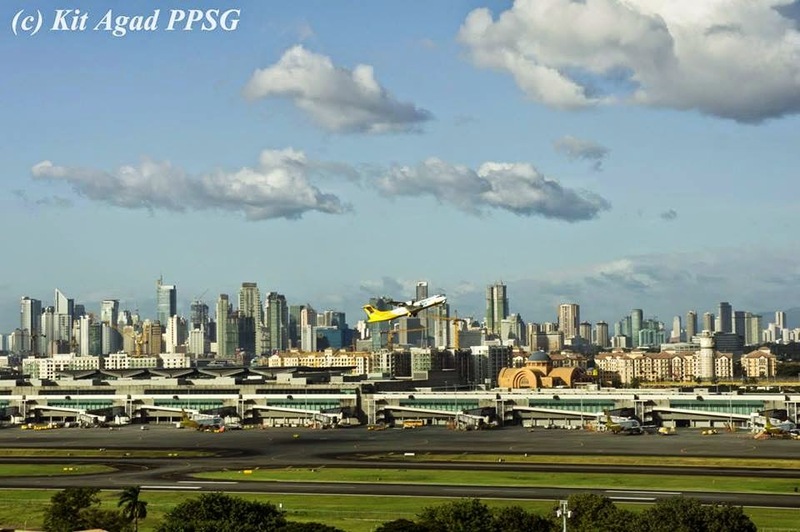 More competition in PPP projects like the Mactan-Cebu International Airport (MCIA) and NAIA Expressway. Winning bidders paid government a premium amounting to P14 billion and P11 billion, respectively. 5. 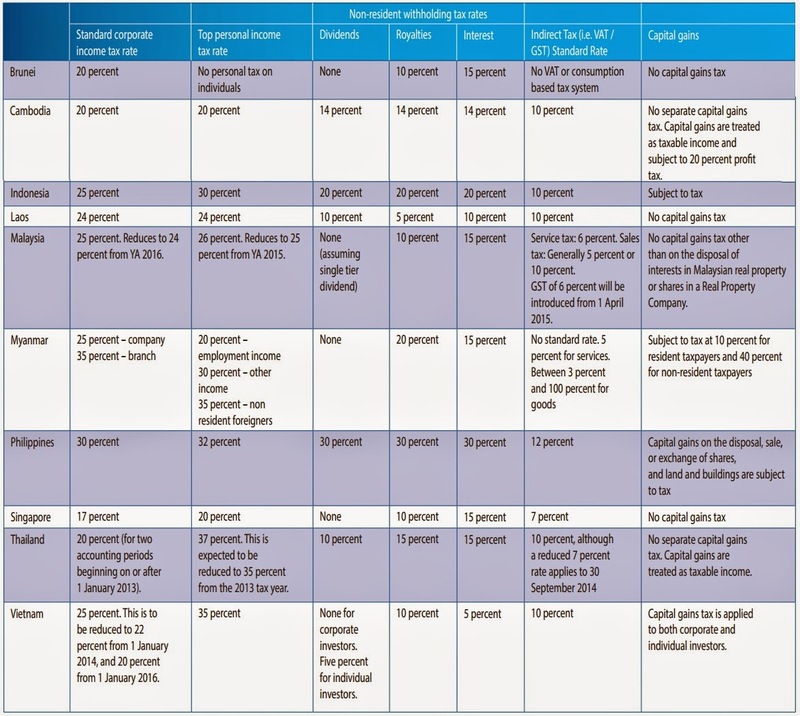 Various infrastructure projects that will be undertaken by private developers at little or no cost to the government, such as (a) Tarlac-Pangasinan-La Union Expressway (TPLEX), (b) Metro Manila Skyway 3, (c) Kaliwa Dam, (d) Laguna Lakeshore Expressway Dike, (e) LRT South and East extensions, (f) Busuanga Airport, and so on. The President though made this opening statement which set the tone for the rest of his address: "It is as if you are watching two hundred TV channels at the same time. You need to understand not just what is unfolding before you—you also need to know what happened before, and where it could all lead.… you must have a response for every question, suggestion, and criticism—and you must have all the answers even before the questions are asked." This is not so comfortable to hear because the President or the government is implying that they are playing God who knows everything and can provide answers to everything. It can be an invitation to central planning. I have no intention of attacking the President but would rather that he mentioned in his SONA, or in future speeches, things like the following. 1. More jobs were created by the private sector as the government has reduced business taxes and bureaucracies and other difficult/complicated requirements. 2. The projected power crisis starting next year can be addressed by DOE and other agencies stepping back from too many requirements and allowing more private power developers to come in with minimum restrictions and permits to submit. 3. Rice prices can go down by (a) deregulating rice importation and allowing more competition among legitimate importers and (b) reducing or removing the rice import tax of around 40 percent (previously 50 percent). The President mentioned that even rice importation, which should have been left to the private sector in a competitive environment, must remain: "This February, the NFA Council approved the importation of an additional 800,000 metric tons, in fulfilment of our buffer stocking requirement… This July as well, we approved the immediate importation of 500,000 metric tons of rice through open bidding. The NFA also has the standby authority to import an additional 500,000 metric tons to prepare for the effects of calamities on harvests and rice prices." Government monopoly or full control of rice importation is so 80s or even early 90s, before the World Trade Organization (WTO) was created in 1996. We are stuck in a Jurassic philosophy that government must continue its rice importation monopoly. The protected groups in the government, both at NFA-DA and their accredited private importers, are the beneficiaries of this faulty policy. Rice should be as cheap as possible. If cheap rice should come from Vietnam, Thailand, Cambodia or India, so be it. Government should reduce or abolish the high import tax and abolish the NFA monopoly. The NFA can continue as a regulator but not as player and proprietor at the same time. 4. No need for a supplemental budget for 2014 to evade the DAP controversy. Additional budget request looks questionable. The total budget in 2013 was P1.88 trillion. This year, it is P2.41 trillion (P 1.61 trillion new appropriations + P 0.80 trillion automatic appropriation), or P530 B higher than last year's budget. This is not enough? Half a trillion peso increase in just one year and not yet enough? 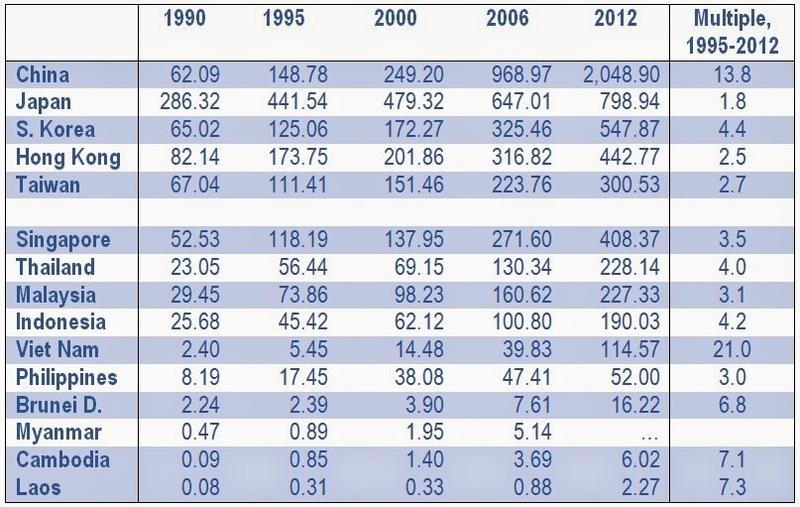 Sources: (1) Bureau of Treasury (BTr), http://www.treasury.gov.ph/statdata/yearly/yr_outstandingdebt.pdf. ** New appropriations P1,608.503 billion + automatic appropriations P796.029 billion. It is true that the government’s interest payment burden has been declining. However, a P353-billion interest payment this year is no laughing matter. The public is angry at the reported P10 billion Janet Napoles plunder in over 10 years or so, but is indifferent to the P353 billion interest payment in just one year -- a big transfer of money from average taxpayers to rich institutions like private banks and bondholders, as well as huge government financial institutions like the SSS and GSIS. 5. Expanding the AFP’s pool of battle ships, navy cutters, jet fighters, combat choppers and other armaments, the huge resources to finance them should not come largely or entirely from additional taxes or huge borrowings, but from long-term lease or privatization of certain AFP/DND assets and properties. 6. Reforming the Bureau of Customs (BOC) and appointing officials who have more integrity is a good move. But as the ASEAN Economic Community (AEC) comes closer (more than one year to go) plus various bilateral and regional free trade agreements, the power of BOC to collect high import taxes and impose non-tariff measures that effectively discourage more international trade should be limited and restricted. 7. Extension of the no-timetable Agrarian Reform (AR) program or forced redistribution of certain private lands does not encourage early and big investments in agri-business and corporate farming. A Congressional bill of extended notice of coverage -- effectively an extended AR program -- should not prosper. The President is a Liberal, not a socialist like Bayan Muna or Akbayan, nor a populist like the other political parties. 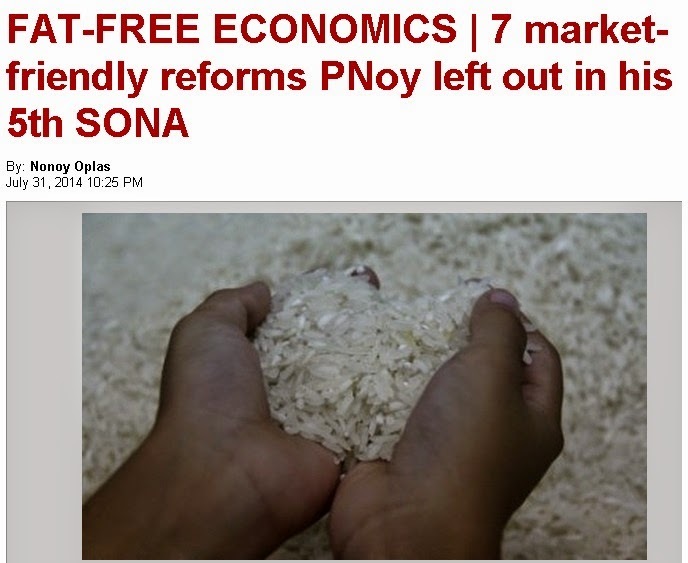 Let us expect more liberal and market-oriented policies from him and his team in his remaining year.